An Officially Licensed Candy Jar decorated with a hand-crafted metal Team Logo. Just add candy and you'll have the perfect gift for the Sports Fan with a 'Sweet Tooth'. 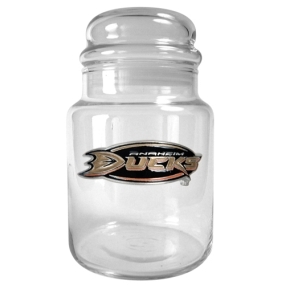 The Anaheim Ducks 31oz Glass Candy Jar makes a great gift idea! * Ships in approximately 1-3 business days. "Thank You for having such great customer service skills. I will definitely visit your site in the near future to make some other purchases. Your company is very easy to do buisiness with."